Outstanding I can feel the chill in the air and hear the water flowing! Stunning scene and light. Beautifully captured. 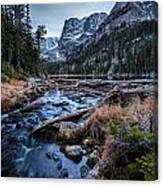 Outstanding wilderness landscape capture Steven. 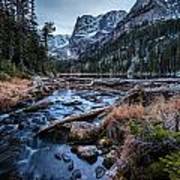 I really love how the flowing water mimics the snow within the crags of the mountain peaks. Amazing depth of field in this stunning scene. Love it! Revisiting this beautiful mountain landscape. Love the moody atmosphere. Stunning! Your wilderness photography always amazes! Thank you very much Ellen! Impressive picture. I get the feeling that it was very cold when you took this picture. Thank you Norman, and yes it was a bit chilly! Thank you very much Marvin! 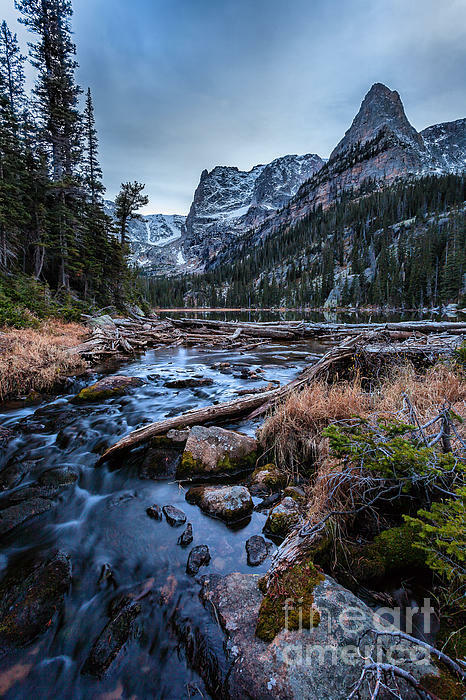 Looking up the outlet of Odessa Lake, located in Rocky Mountain National Park, Colorado, usa. My full portfolio may be found at: http://steven-reed.pixels.com All photography in this gallery is the original work of Steven James Reed. All rights reserved. It is for sale, copyrighted to Steven Jams Reed, and as such, is protected by all US, and international copyright laws. 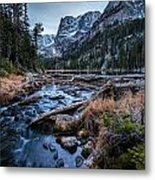 The Fine Art America watermark will not appear on any purchased images.